Mansfield Town look likely to be down to 15 outfield players for this weekend’s tough trip to Hartlepool United. Central defender George Taft was their latest injury victim in Saturday’s 1-0 home defeat by Barnet and, although Stags have not yet had the full analysis of his hamstring injury, it seems unlikely he will be ready for the weekend. Adam Chapman joined fellow central midfielders Chris Clements and Jack Thomas on the treatment table before last weekend with a groin strain and it seems unlikely any of those will return to full training this week. On loan defender Kyle Howkins is out with a hamstring injury for at least a month and striker Danny Rose is battling on with a protective mask on his fractured eye socket. Taft’s injury was not helpful on Saturday as Murray’s formation had to be changed midway through the first half. “Again after 20 minutes we had to change the whole thing, which threw us,” said Murray. “I thought the shape looked really good for the first 20 minutes and we were controlling it. “At the minute the injuries are starting to tot up and starting to have an effect on what we can do. “To be honest we probably haven’t had our strongest team out this season, so that is becoming a pain. We are down to 15 fit outfield players. He added: “We were hoping this morning the checks would come back positives in the assessments of the players we thought may be back, but we are looking at probably another two or three weeks before we see any more bodies back. “So it’s tin helmets on and get through it. Although we are down to 15 players, they are good players. “It hurts your consistency not being able to name a same XI week after week where everybody start to grown with each other. “That’s a problem at the minute, but we do still have 15 very good players. Murray was not anticipating good news on Taft this week. “We’ve not had the scan results back yet but our physios are very good here and they’ve told me it’s not good,” he said. “It’s one of those things. We are not doing anything on that side of things physically any different to what we were doing last season, and we didn’t get anything. “Sometimes Lady Luck doesn’t like you does she? She likes to kick you in your face. “But every team goes through it. Everybody has it and it’s good we are having it in the first two months of the season when we are three points off second. 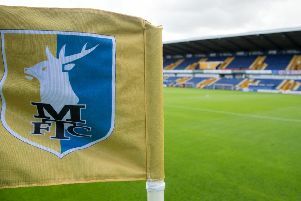 With the transfer window closed until January and Stags going with a small squad, Murray admitted: “This is now the gamble. We are in it.